By George (Town) we arrive! Deemed by many to be the cruising Mecca of the north Atlantic, George Town promises and delivers an experience to be remembered and repeated time and time again. 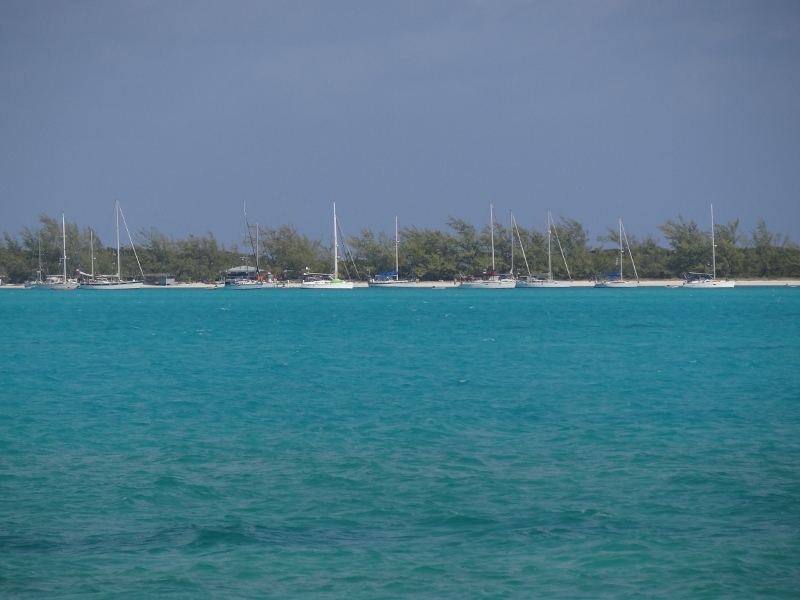 Elizabeth Harbour sits between Great Exuma Island to the west and Stocking Island to the east. The anchorages are along the beaches of Stocking Island: Monument Beach, Honeymoon Beach, Volleyball Beach and our spot, Sand Dollar Beach. While 200 boats rest peacefully throughout the harbor now, 99% of them at anchor, by mid-Feb to mid-March nearly 400 will be packed into the harbor for fun, games, hikes, meeting old and making new friends and simply enjoying life on the water. We liked the looks of Sand Dollar Beach; less boat traffic and less beach activity than the others, also reasonably good holding in mucky sand. We did what cats are required to do and that’s get in close to shore in shallower water and drop the hook. Maybe a bit too close in; 4.2 ft at low tide was acceptable, but if the wind switched to out of the west we’d be in deep- no, shallow do-do. The next day we moved about 2 boat lengths south along the beach and out just enough to place us in 8ft. I lost count of the number of attempts we made to get it right- ‘cuz hey we also had to be positioned properly with regard to the two boats behind us. Unless you are anchored in Kidd Cove right near the entrance to Lake Victoria- the hub of George Town you’ve got yourself a mile-plus dinghy ride. We won’t mention the continued problematic chaps on Bunting – nooo, the problem side doesn’t get lifted off out of way because the Velcro/Hypalon patch worked soooooo well- unh uh. Many who spend serious time in GT have adopted the GT dinghy stance, made necessary by the very long, often wet ride into town or even to one of the beaches from your home base. We’ve noticed that boats will leave their spot to spend the day in Kidd Cove then return and re-anchor just to avoid that fun slog in to town. Lake Victoria has one narrow entrance point and when the wind is up the swells can catch you off guard; luckily the incoming dinghies have the right of way. On our second trip in (Sat) we had visions of water over the bow as we plowed up to the entrance. The main road and businesses ring the lake and just about everything one would want or need is here. We joined the library for $3/yr and that got us books to swap and books to take out- return whenever you can! 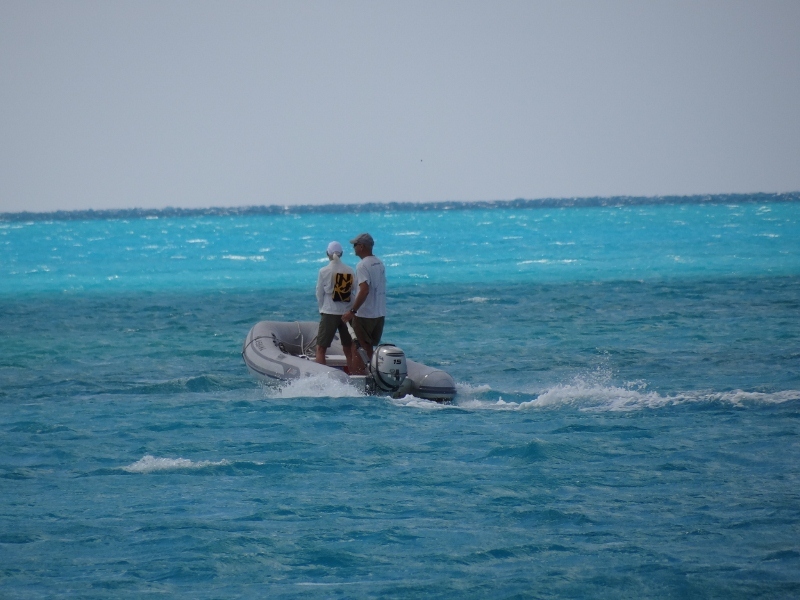 Exuma Markets provides a long dinghy dock as well as good water with a hose hook-up. At the Shell Station you can purchase diesel and gas for approx $5.75/gal- ouch- just dinghy up and fill your jugs. 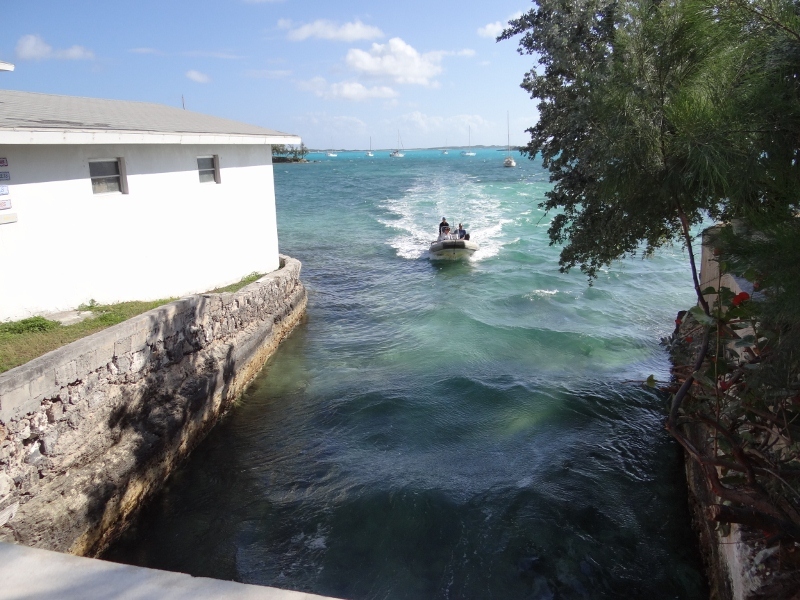 Yes, the price is high, but Chub Cay was $6.05 and in Nassau we paid about $5 for diesel. The goal is to fill up our diesel tanks once more before we cross back to Florida, not counting an occasional 5 gal jug of diesel to replace what we use to run the genset. Wi-Fi is available in town and some boats are lucky enough to get it from the harbor. We have finally learned not to judge a business by the building. J&K Productions, operated by Julius and his wife is the place for a good internet connection, technical assistance, spare parts and getting more air time uploaded onto your phone. For the next week the blog is coming to you from Chez Julius- not free as you may recall, but a reasonable $15/week. Maybe I should ask for Wi-Fi donations rather than Bahama Mamas! Various activities take place on the beaches and are announced on the net at 8am each morning. 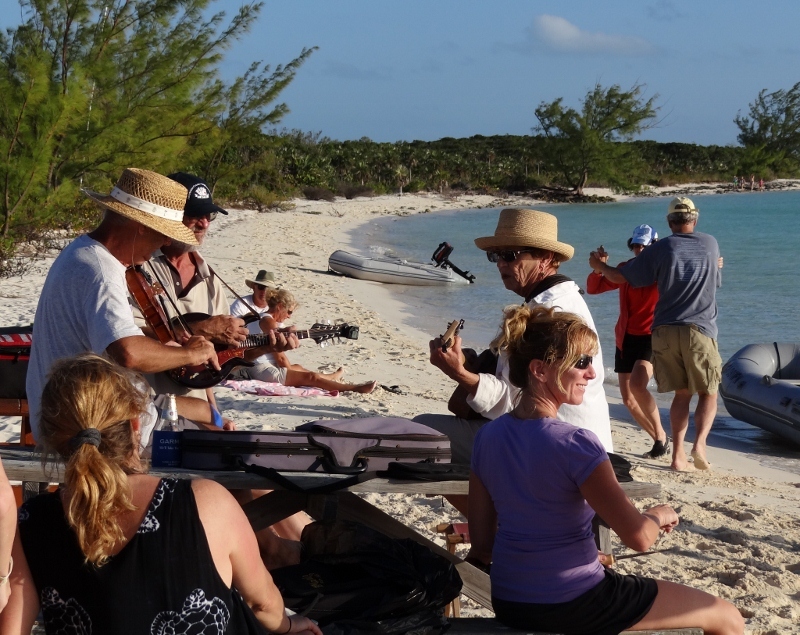 Sat at 3pm was a jam session on Sand Dollar of string instruments so we timed our beach walk then enjoyed the music for over an hour. This entry was posted in Uncategorized and tagged beach. Bookmark the permalink.